Is divorce different for dads? Can we still use the excuse that we don’t know how to process feelings and therefore, men’s emotional lives get glossed over? 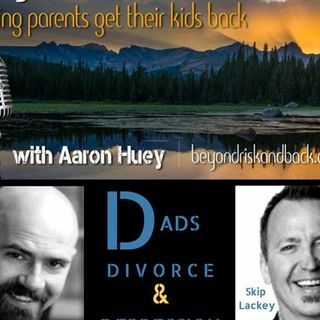 Skip and your host Aaron Huey, owner of Fire Mountain Residential Treatment Center, discuss the bare bones of recovery after divorce for dads. Skip has been in the personal growth, leadership and wellness fields for over 30 plus years and has worked directly with over 15,000 clients, taught over 1000 workshops and done over 1000 personal ... Más informaciones appearances. He was the CEO for Evolution Unlimited – the personal growth seminar company that offered a modality called - The Journey in North and Central America before he took a much needed break from traveling and is thrilled to be back teaching The Journey again in the US and Canada. Skip has turned his attention to bring conscious skills and emotional intelligence into the workplace with his leadership development company – a leadership development company that trained and certified 100’s of Leadership Coaches called - The Praxis Leadership Academy. He also has a website where you can learn meditation called MeditationPrescription.com. And a site for a new small business coaching company called - 5Starbydesign. You can see what he’s been up to at www.SkipLackey.com. Skip also spent over 25 years working in the entertainment industry in every way imaginable and performed live for well over 1 million people on Broadway, Movies, TV, Commercials and he was even a game show host for Nickelodeon and a Ringling Brothers Clown. He brings his sense of humor and presence to everything he does!